For an unforgettable action-packed day, take Iceland’s most iconic tour, the Golden Circle, and afterwards head out to sea for some whale watching. Step on board our all new bus fleet, equipped with computer tablets in each seat. On the tablets you can use our GPS Sensitive In Bus Audio Guide, available in 10 languages. So, if you wish to know interesting facts about Iceland and the places you will visit on the tour in a language that you are likely to be comfortable with, that is very possible. Onboard you will also find a USB Charger and free WiFi. Should you have any questions during the tour or about our small country, you can ask the host who will happily assist you. ​​The Golden Circle is made up of three of Iceland´s most treasured natural wonders: The beautiful Þingvellir National Park, where the continental plates have been pulling apart and where the world´s first democratic parliament was established; the spectacular spouting geyser, Strokkur; and the powerful Gullfoss Waterfall that thunders 32 meters down into a deep canyon. This tour showcases some of Iceland´s most picturesque countryside and unspoiled nature. Departures for the Golden Circle Tour are at 08:00 and the tour lasts approx. 7,5 hours. 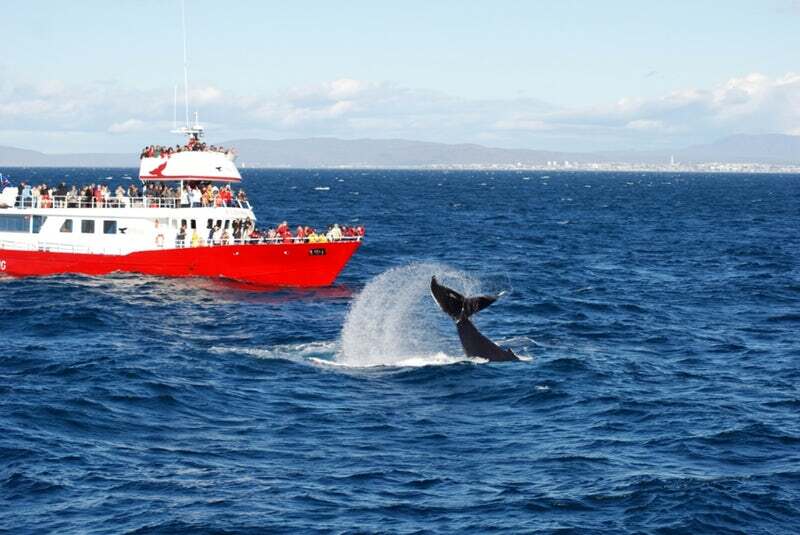 Departure for our whale watching trip is at 17:00, which means that those going on the 08:00 Golden Circle Tour will have around an hour before boarding the whale watching ship. Here’s the perfect opportunity to explore the quaint old harbor with its design boutiques and coffee houses, or simply stroll around and take in all the action in the busy harbor. On your return to Reykjavik it´s off whale watching from Reykjavík harbor. In the bay can be found a large variety of whales, dolphins and birds that happily enjoy the long days and bright nights of the Icelandic summer. 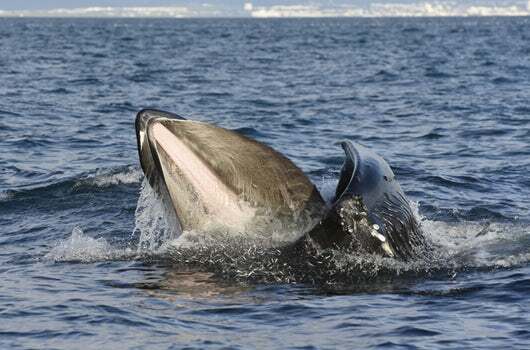 The minke whales are playful and in large numbers, along with the quick and quirky white-beaked dolphins, the cute harbor porpoises and the huge humpback whales. We have more than 15 years experience of guiding and operating whale watching tours in the Faxaflói Bay, so you can be certain that we love and respect the whales and other wildlife in our native bay. Our trips always bear in mind the well being of the whales and we are also active participants in the protection and research of whales. All of our whale watching tours start from our ticket office on the Ægisgarður pier at the Old Harbour in Reykjavík. Your whale watching guide will meet you in our Whale Watching Centre located on board an old fishing vessel that is permanently moored at the pier. Before or after the tour you can enjoy the on-board multimedia show that includes images and videos providing lots of fascinating facts about the whales and marine life in Icelandic waters. The next stop is at Geysir Hot Spring, the home of the one-and-only original geyser and Iceland’s most iconic natural attraction. Steaming hot water erupts from the famous Strokkur Geyser every few minutes. We then drive you back to Reykjavik where you will be dropped off in the Old Harbor of Reykjavik for the whale watching tour. Usually, you arrive at 15:00 and you have about 1.5 hours to explore the Old Harbor before setting out to sea at 17:00. The starting point for Reykjavik Sightseeing Tours. Reykjavik Terminal, Skógarhlíð 10, 105 Reykjavik. • Tours depart from the Reykjavik Terminal located at Skógarhlíð 10. Please be sure to arrive 15 minutes prior to departure along with a printed or digital copy of your ticket/voucher. • If you have booked a hotel pickup with Smartbus™, please be at your chosen pickup location 30 minutes before the departure of the tour. Look for the Green Smartbus™ which will be outside your accommodation at within the 30 minutes of pickup. The first stop along the Gold Circle features a stunning views over the rift valley. A UNESCO heritage site with beautiful geographical features and a rich political history. Located on the northern shores of Þingvallavatn (Iceland's largest lake), Þingvellir (anglicized as 'thingvellir') is the national pride of Iceland and our first National Park. It is, for one, a key location in Icelandic history as the oldest existing parliament in the world first assembled there in 930 AD. For this reason, Þingvellir has been designated a UNESCO World Heritage Site and is, therefore, a protected national park due to its unique geology and natural features. From the viewing area, the Almannagjá canyon between two tectonic plates can be seen, a visual representation of continental drift. As the first stop along the tour, you will have an opportunity to walk through the park and use the restroom if needed. The most iconic Iceland natural site, the Geysir hot springs are home to the original erupting geyser. A favorite stop along the Golden Circle is the highly active Geysir Hot Spring Area with boiling mud pits and the lively Strokkur which spouts water 30 meters (100 ft) into the air every few minutes.The area became active more than 1000 years ago and comprises more than a dozen hot hot spring holes. Although one can only see steam emerging from the surface of Geysir these days, its name was adopted to represent spouting hot springs all over the world. Along the tour, the newly opened Geysir Center offers guests and travelers a chance to use the restroom and to catch some refreshments as well as lunch. A powerful and inspiring place. There the glacier water thunders down 32 meters in three steps and into a narrow canyon with an breathtaking roar and grandeur. 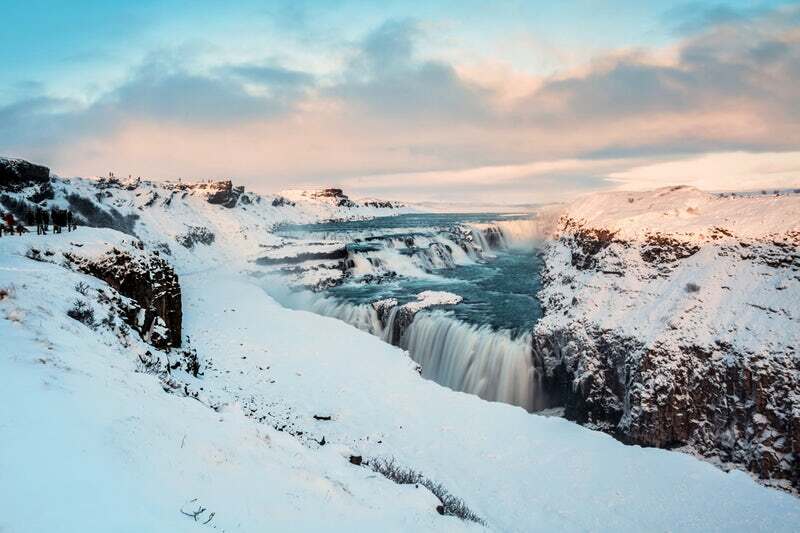 As one of the most popular attractions in all of Iceland, Gullfoss is a waterfall located in the canyon of Hvítá river in the southwest of the country. The beautiful Hvítá river rushes southward in three steps into a narrow canyon with a breathtaking roar and grandeur. Furthermore, on clear days the magnificent Langjökull glacier, Iceland's second largest glacier, can be seen in the distance. Guests and Travelers may use the restroom and purchase food and refreshments at this location as well. Head out to sea and go searching for the whales of Iceland with Reykjavik's original whale watching company, Elding. After a full day of sightseeing, we will drop you off at the Elding Whale Watching office. After checking in and hopping on board, you will receive warm clothing if you feel it needed and you will find several outdoor viewing platforms, a large indoor saloon with an on board café with light refreshments, basic bathroom facilities. Once underway, an on board guide will be there to will commentate on the sights and views at hand through the intercom system on board and will be available to you and happy to answer any questions you may have throughout the tour. In-Bus-Audio-Guide: We recommend that you bring your own headphones, simply because they will fit you best. It is also great for the environment.If you don´t have your headphones, with you or forgot to bring them, no worries we sell earphones on board. ​*If you don’t have warm clothing we will supply you with a very warm overall and more gear, as well as having some sweaters to lend on the Whale watching boat. ​“Whale Guarantee”: If we find no whales on your tour you get another free try on our classic Whale watching tour. ​Please show up at our Reykjavik Terminal (located at Skógarhlíð 10) 15 minutes prior to the departure time. Please be ready at your pick up point with your voucher, either in digital or printed form.